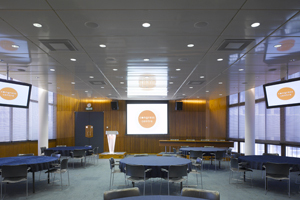 London conference and events venue Congress Centre has upgraded the audio-visual (AV) facilities at its Council Chamber. The Council Chamber is the second-largest events space in the 1950s listed venue – a wood-pannelled room that can hold 160 theatre-style and 200 standing. New equipment includes a digital sound desk and HD projector, while the room has been rewired and kitted out with new front-of-house speakers and wide screens. Ruby Chagger, Congress Centre’s conference and sales manager, said: "The Council Chamber now has in-house AV facilities to rival those in Congress Hall, our largest events space, which means that there’s no need for event organisers to bring in external AV equipment to achieve outstanding results."